We’ve met Sabrina N. (24), who is currently in the middle of her Working Holiday year in Japan. 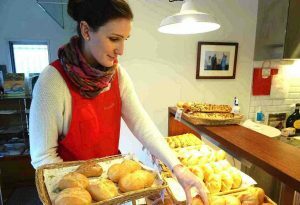 She is doing a part time job at Deutsche Bäckerei Tanne, a German bakery right in the center of Tokyo. 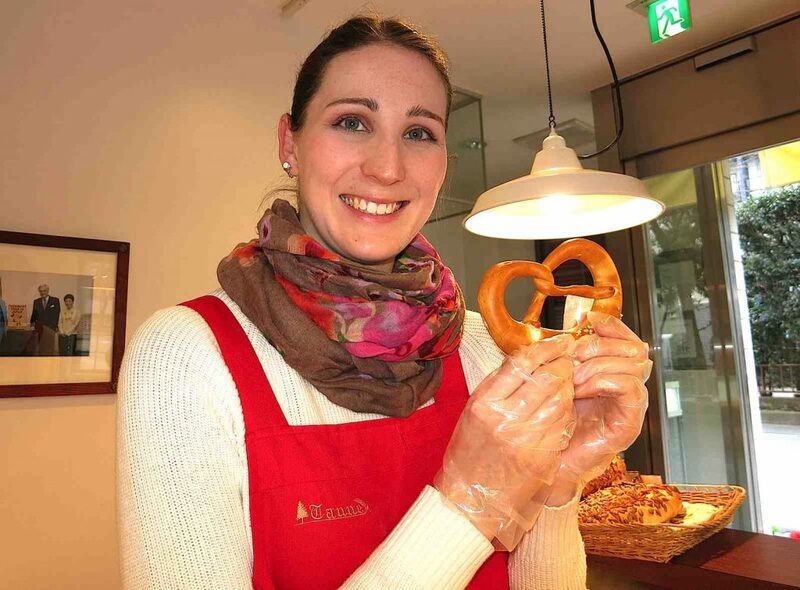 Who knows Tanne, knows that it’s famous for selling one of the best German style pretzels and hand made rye bread all over Tokyo. 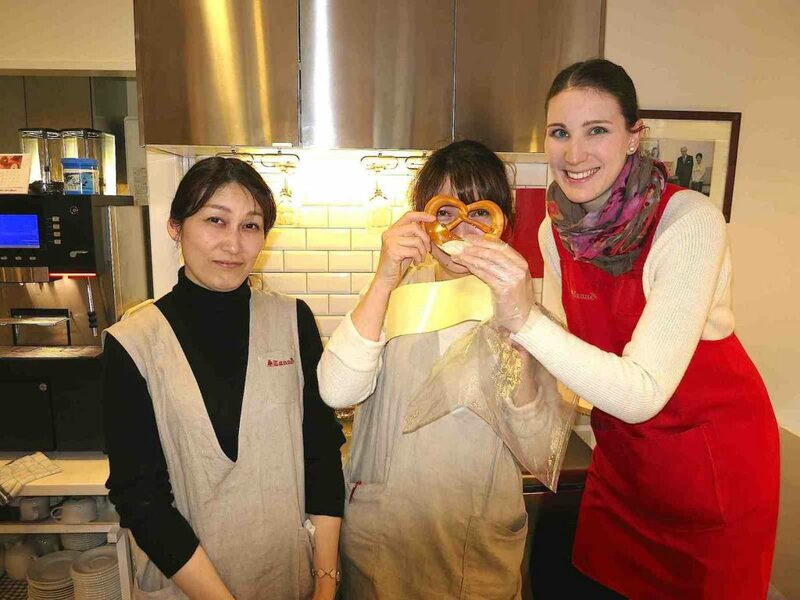 As one of various German bakeries, which have long been established in Japan by now, Tanne is delivering the German embassy, cultural events and also owns a café and store. We sat down with Sabrina for an interview. Sabrina, how did you land this job? I’ve been to Japan once before as a tourist in 2015. It was in summer and I stayed for three months, as I had some spare time before starting to write my master thesis. I’ve always wanted to go to Japan and a German friend of mine, who is living in Tokyo, sublet a room of her share apartment to me. It was perfect timing! Three months is a long time, so I started to think that I wanted to challenge myself. Even though I wasn’t allowed to receive any salary as a tourist, I felt like working a little bit and make some work experience. The same friend also introduced me to Tanne then, because she has been working there in the past. I’ve had a short talk with the manager of the store. They were searching for someone to help out at their market booth at the German Spring Festival in Yokohama, which I did then for four days. Going back to Germany, I graduated university and came back to Japan in 2016 for a Working Holiday. When searching for a job, I remembered Tanne and applied by email. This time I had a real job interview, it was more formal, I had to talk more Japanese and the actual bakery owner was there, too. But luckily they immediately took me. Well, you need to have at least a basic knowledge of Japanese. That’s because you have to be able to communicate with the customers and your Japanese co-workers. You should at least know how to write and read Hiragana and Katakana, because sometimes you have to write down orders by hand or read cards which the names of the products are written on. But in my opinion that’s nothing you can’t learn within a short time. For example, at the time I was helping out at the German Spring Festival in Yokohama, my room mate helped me to prepare myself for the job by making a list of standard phrases that you need to know when working at a booth. Like “Welcome, how about some fresh German bread?“ and so on. I just memorised a lot of words like these and the rest came with learning by doing. 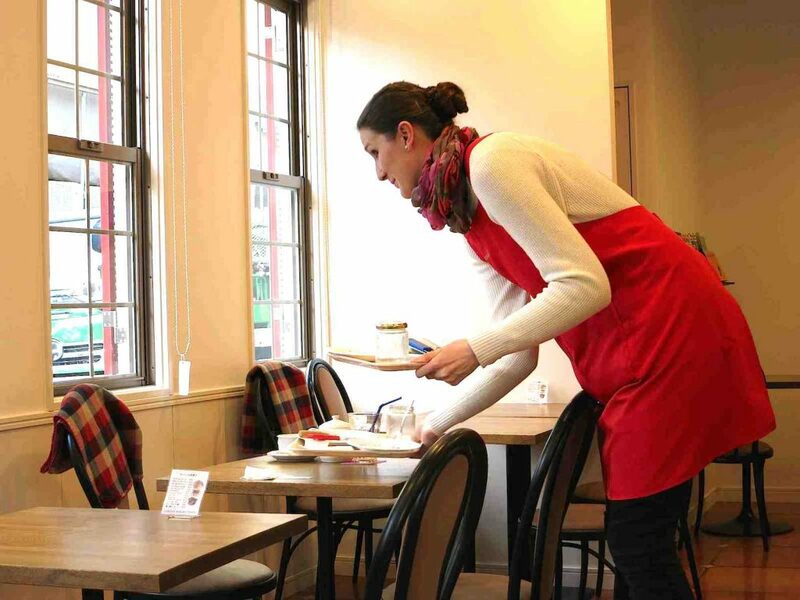 How long have you been working at Tanne by now and what are your general working hours? I started at the end of November 2016, so it’s my third month now. I’m working around 5 times a week and my shifts are between 8 and 9 hours long, having a 45 or 60 minutes lunch break in between. The shifts are from 7:30 or 10:30 in the morning. When having the shift that starts at 7:30, I have to get up at 5am… It’s kind of hard sometimes, but that’s just how it is. I receive something between 932 JPY and 1000 JPY an hour. 932 JPY is the minimum hourly wage in Tokyo. I get reimbursed for commuting to work, too. Unfortunately I get deducted 20% taxes off my salary. This is Japanese law, if you are here on a Working Holiday visa. This is not enough to cover all my living costs. That’s why I think it’s essential to save a certain amount of money before coming to Japan for such a long time. Fortunately I did so. Also doing more than one job is an option. Actually, I’m working in a German restaurant, too, but not very often. And I give private English and German lessons two to four times a week. 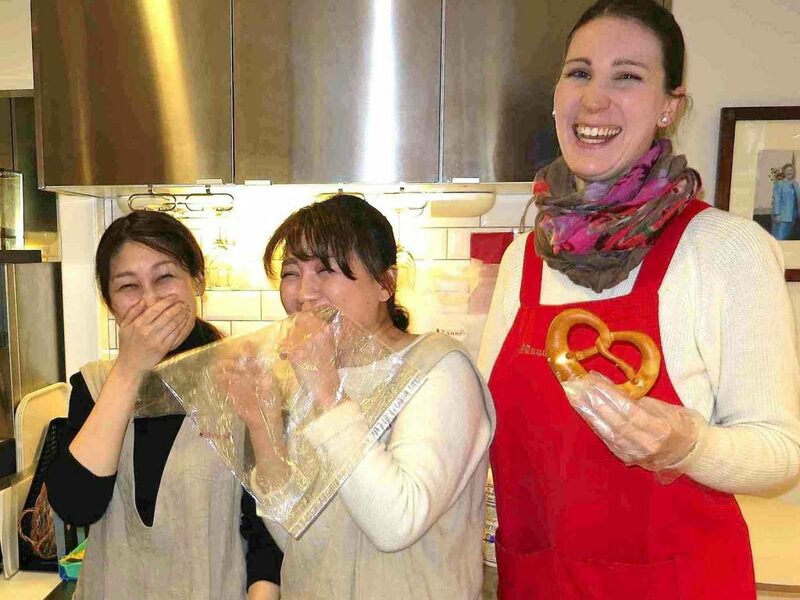 A plus about these private lessons is the rather high hourly wage of 1,500-2,000 JPY. You can negotiate this with your students. But a big minus about this job is that it’s unsteady money. You always have to expect that a student cancels an appointment. I’d rather call it pocket money than proper salary. What are your duties at Tanne? My main tasks are close to those of a bakery sales assistant in Germany, I think. 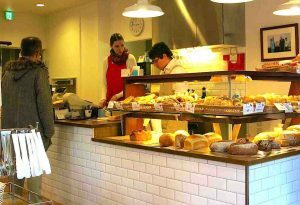 Filling the shelves of the shop with bread and pastries in the morning and empty them in the evening. I’m serving the customers, pack the product they’d like to buy, do the cashier and wipe the coffee tables. On some days I have to prepare the sandwiches we are selling. Answering the phone and advise customers about our products. For example quite many of them want to know the exact percentage of rye flower in our breads. And packaging! There is always to much to wrap up. Especially when we have to prepare for an upcoming event, such as a christmas market. In generell, yes, I do like the job a lot. I like to communicate with people. An office job wouldn’t be a thing for me. Also, I’m getting freshly baked bread for lunch time, which gives me a sense of home. The café always smells so good! And I love my co-workers. Although I sometimes would appreciate them to explain things more accurately to me. There are times I don’t understand everything right away and sometimes I don’t get told reasons for things. General said, I feel being a jobber is a bit risky, because in some cases you won’t conclude a contract. You are just been given your shifts as the owners like to. Of course you can hand in requests, but doing arubaito [side job] kind of makes you feel like your life is depending on every single one of your shifts. Do you think working at Tanne helped you improving your Japanese? My God, yes! Back in Germany I learned some Japanese, but only for my self. But it was definitely not on a proper communication level yet. Working in Japan helped me a lot to improve my Japanese skills. It’s still not that good, but compared to before, it’s way better. However, one thing that is still very hard for me to master is keigo [honorific language], which you are supposed to use when talking to a customer. Besides the language aspect, what did you learn doing this job? A lot! For instance I came to the personal conclusion, that German people are working more efficiently. At least that’s how I feel. BUT on the other hand I also feel that German people who are working in service could learn a lot from the Japanese when it comes to politeness. The same applies for the people who are receiving a service. You see, I realised that people working in service are doing their best effort. That should be rewarded with the kindness that I’m currently experiencing in Japan. Also, the fact that I’m able to work under more difficult conditions, such as the language barrier, totally pushed my self-confidence! What brought you to Japan to in the first place? What are you doing besides working? I enjoyed my first stay in Japan, the time I lived at my friends place for three months, so much, that I decided to come back. For longer. I wanted to challenge my self, soaking up the culture more than I could within these three months. Working and living here, I’m now able to do that. And this is very special to me, as I’m interested in Japan for the longest time. I’m actually a cosplayer and love gaming, Anime and also Japanese music. I’m able to enjoy some of these hobbies more extensive, than I could in Germany. For example I’m attending concerts of Japanese bands pretty frequently. What’s really special to me is that a lot of German friends came to visit me here. I’ve been visited around 7 times by now. That’s because I have a lot of Japan enthusiastic friends, who would have traveled to Japan sooner or later anyway. But the timing for them to come when I’m in Japan was just perfect. I’m very grateful fort hat. Although I started feeling like a tourist guide more than once. Can you give our readers a resume about your impressions and feelings about your Working Holiday? Sure. I think people who want to come to Japan for a Working Holiday should definitely do it. It enriched my life. But everyone should be beware of the fact that it’s not easy. Cultural differences can complicate your daily work routine. But if you find a job you can enjoy, with great co-workers, you will be able to bear potential troubles. I’m grateful for having found such a job at Tanne. And I’m happy to have made friends for life during my time here, at work and out of work. However, to be honest, I can’t imagine continuing this job after my Working Holiday is over. Not because I don’t like it, but just because I want to make the best out of my masters degree in art history on a long term.